Because barbecuing is more than just slapping some meat on a grill, we’ve decided to break down the various elements that your dad may enjoy. Whether he’s more of a gourmet chef or a gadget lover, each of these presents is sure to tickle his fancy. Although meat is flavorful, there is only so much deliciousness to be had when you put a burger or some ribs on the grill. If your dad is craving some extra flavor to kick things up a notch, then you will want to get some high-quality rubs and spices to enhance his next backyard cookout. Here are some examples we like. Whether your dad loves a good brisket or a delicious steak, he can add the zest with Lane’s BBQ. The company makes an assortment of rubs and general spices that work well for all cuts of meat. Best of all, they come in abundant sizes so that your dad won’t worry about running out for his next barbecue! Texas is a state that knows a thing or two about grilling, and this brand hails from the barbecue capital of the world. One of the best rubs that the company offers is their patented SPG, which is merely a mixture of salt, pepper, and garlic. Keep things simple and tasty with a perfect blend of all three spices. What makes it even better is that you can use it on anything! If your dad has a more refined palate, then you want to get him a set of rubs and spices that will tickle his taste buds and add some extra flavor to the meal. The Killer Cook is a brand that specializes in high-class rubs that run the gamut from salty to sweet. Whether he likes more of a Caribbean-inspired zest or a traditional spicy barbecue, the Killer Cook can satiate his needs. Although most people wouldn’t associate Seattle with world-class barbecue, the fact is that this Washington company is making some of the best rubs around. We like them because you can get a rub for every occasion, whether you’re cooking ribs, chicken, or seafood on the grill. If your dad wants to experiment, then these rubs will help him explore his creative side. While rubs and spices are excellent for adding flavor to the meal, we know that most dads like the experience of grilling as much as the result. When you buy him one of these accessories, you will be enticing him to up his grill game and become the king of the neighborhood. If you want precision while cooking, you need to temp your meats. However, that also means that you have to open the grill and let all of the heat and smoke out. With a wireless thermometer, dad can keep an eye on the burgers and chicken without having to endure a face full of fire. Is there anything more mouthwatering than watching meat roast over a spit? We didn’t think so. Rotisserie trays can be adapted for all kinds of grills, whether he likes to cook over an open flame or a propane model. You can also get spits that have flat bottoms so that you can prepare a wider variety of meats and vegetables. Cooking is fun, but cleaning is not – that’s just a fact. Save your dad the hassle by letting a robot do the work. Is there anything else we have to add? Although there is some fun involved with using a traditional lighter, sometimes you want something more reliable. An electric lighter can add some high-tech options to his grilling experience and ensure that he always has a light. Never run out of fuel again! One problem with grilling is that it has to be done during the day. However, if your dad wants to start cooking dinner on the barbecue, then you should get him a spatula with a built-in flashlight. Never again will he have to guess if his burger is done! Want to have access to Grill Masters Club BEST Father’s Day special? Click here and sign up for our waitlist to receive the offer. Perhaps your dad is tired of grilling and wants to explore other barbecue cooking options. If that’s the case, then smoking is the next logical step up, so why not push him in that direction by getting him some high-quality gear to do it? Whether it’s ribs, sausage or brisket, smoking brings out the best flavors. If your dad doesn’t already have a smoker, then this conversion kit will turn any charcoal grill into the next best thing. It’s easy to set up, and the results speak for themselves. Best of all, you can get the same benefits of a full-size smoker at a fraction of the cost. Another option is to get a smoker that has all of the parts included. The Ugly Drum Smoker is the perfect gift for a dad who loves tinkering as well as grilling. Putting it together is not too complicated, and you can get smoking in no time. It also looks like a standard oil drum, so he can say that he built it from scratch and get even more enjoyment out of it when telling his buddies. While most of us have heard of using woods like hickory or maple, what about trees that aren’t in the US? If you order from Exotic Wood, then you can get grains that would otherwise be impossible to find. Order wood from Jamaica or other parts of the world and see how they can transform your dad’s smoking game. Yes, importing wood is a little pricier, but the results are so much better. If your dad is still new to indirect cooking, then you may want to have him brush up on the essentials before he goes all-in on his next cookout. There are a lot of great books out there that can turn your dad from a smoking novice to a full-time professional. Smoking is more of an art than it is a cooking method, which is why you have to do some experimenting if you want to get it right. Buying an assortment of different woods will offer the chance for your dad to see which ones work best and which ones have the best flavor. Not only that but it will ensure that he uses all of them, so it’s a gift that keeps on giving. Rubs and grills are perfect for beforehand, but what about when you just want your meat slathered in flavor? With a set of high-quality sauces, you can help your dad make the most out of his grill and help him realize his full potential. Also, sauces are great for the father who isn’t the best cook, as they can cover up some of the mistakes on the grill. Whether you want a little garlic in your life or something a bit tangier, Torchbearer has you covered. You can find a wide assortment of robust mixtures that will elevate anything they touch, whether it’s chicken wings or a set of pork chops. Best of all, they use all-natural ingredients, so you get the ultimate flavor without a lot of filler. Located in Alabama, Big Bob has been whipping up some of the finest sauces in the country. His signature white sauce will be the hit of your dad’s next cookout, and he will wonder what he’s been doing without it all this time. You can also find spicy versions and sauces for every occasion. Why limit your Lane’s addiction with just rubs and spices? When you get one of their signature sauces, you can increase the flavor profile of your meat and create something extraordinary. What we like most about Lane’s is that they provide a much larger assortment of flavors than most other companies, meaning that you can let your dad experiment even more. Whether it’s chicken, pork or beef, Lane’s has the right sauce for you. 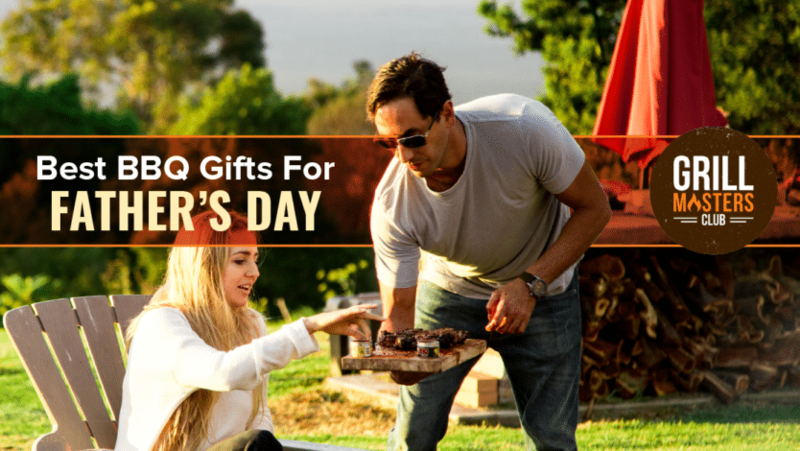 But What Is The Best BBQ Gift For Father’s Day? We’ve seen a lot of excellent gift ideas here, but we understand that it can be a little overwhelming. If you’re not sure what your dad will love, then give him the gift of a monthly subscription! 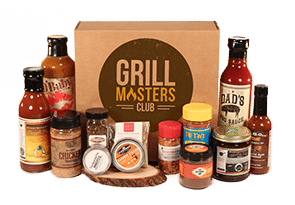 At Grill Masters Club, we curate our boxes to ensure that your father will be able to try new things while getting his barbecue on. We source locally-made products that will boost your grilling game and make you want to cook outside every night! Your dad will love the variety and the fact that he can look forward to a new box each month. With Father’s day on the way, now is the perfect time to start thinking about what to get the most important man in your life. If he’s like most guys, then he probably enjoys cooking on the grill. Thankfully, Father’s Day occurs just when summer is about to get into full swing, so you can make sure that he gets a gift he can use right away. What is a BBQ subscription box?